Gayle King is the well-regarded best friend of one of the most popular and financially successful personalities in television history. The Connecticut newscaster has been close pals with Oprah Winfrey since their humble beginnings at a Baltimore television station, and Winfrey often recounts "Gayle" anecdotes to her viewing audience, which numbers in the millions daily. In contrast to Winfrey, King has led a far more sedate life as a news anchor at a Hartford CBS affiliate since the early 1980s, and is a divorced mother of two. In 1997, she hosted her own half-hour nationally syndicated talk show that enjoyed a year-long run. King, the envy of many, has occasionally found herself on the receiving end of Winfrey's well-publicized generosity. As she told Jim Calio in a 1998 Redbook interview, "Who wouldn't want to be her best friend?" King was the first of four daughters born to Scott and Peggy King. She spent several years as a child in Ankara, Turkey, where her father was stationed; he later became an electrical engineer and King enjoyed a comfortable, middle-class upbringing in Maryland. As a college student at the University of Maryland in the mid-1970s, King obtained her first job in television at WTOP-TV in Washington, DC. Though she was studying psychology at the time, she decided to pursue a career in media instead. In 1976, she was working at Baltimore's WJZ-TV as a $12,000-a-year production assistant. At the station, one of the news anchors was an unknown just a year older than King named Oprah Winfrey. King was still living at home at the time, and during a particularly bad snowstorm one evening, she faced a long and slow drive home. Winfrey invited King to bunk at her place nearby instead. The pair gossiped about co-workers for hours that night, and became fast friends. King recalled being shocked when they went shopping together and Winfrey was able to afford two sweaters at the mall. Even though their career paths soon took them separate ways, they remained close. Each remember spending Friday nights in the late 1970s on the phone, long-distance, watching the popular nighttime soap opera Dallas simultaneously. King had been hired in 1978 by WDAF-TV in Kansas City as a news anchor. She eventually began dating a local police officer, Bill Bumpus, and the pair were wed in 1982. King was then hired for the news team at WFSB-TV in Hartford, Connecticut, and has made the city her home since. With her husband-- who earned a law degree from nearby Yale University--she had two children in the late 1980s. King and her husband asked Winfrey to become godmother to both. By then an extremely successful talk-show host, Winfrey also helped out by contributing generously to a "nanny fund" she set up for King upon the birth of her second child. King has said that it is only because she has been able to hire a good caretaker for her children that she has successfully balanced both career and motherhood. Since 1982 King has been co-anchor on the local news of Hartford's CBS affiliate, and has become a popular, Emmy-award winning television personality. Yet she has also achieved a more national celebrity because of Oprah: millions tune into the Oprah show daily, and the popular, personable host and the details of her life are well known to viewers. On the air, Winfrey speaks often of King as her best friend, and sometimes recounts the practical jokes she and King play upon one another. "Gayle is the reason I don't need therapy," Winfrey told People writer Samantha Miller. "People come up to me, introducing their friends to me all the time, saying 'She's my Gayle.' I wish everybody had a Gayle in their life." There is also a downside to King's fame. "A lot of people come up to me and I know they have an agenda," King told Calio in Redbook. "They have a movie script or they need some bills paid or they need a loan." Yet network executives also saw potential in King: if she was remarkable enough to share a confidential friendship with the divine Oprah, then the viewing public might also love her. King began to be courted by production companies interested in giving her a show of her own. In 1991, she hosted a short-lived NBC newsmagazine called Cover to Cover, and in 1997, after much negotiation, found herself with her own half-hour syndicated show bearing her name. King had it written into her contract that the show would never appear in the same time slot as Winfrey's show in any of its 200-plus markets around the country. Eyemark Entertainment, connected with the CBS network, also believed so fervently in King's drawing power they built a studio next door to WFSB in Hartford so that maintaining two jobs would be easier for her. Most daytime shows are based out of New York or Los Angeles, but King, divorced in 1993, refused to relocate because of her children, who still spend a great deal of time with their father. The Gayle King Show debuted in September of 1997. Winfrey, not surprisingly, was a big help to King on a number of matters, advising her about her on-screen wardrobe and even offering critical assessments of the set furniture and theme song. When Winfrey told King that some publicity shots were unacceptable, King heeded her advice and had them redone. But when Winfrey told her to get rid of one particular chair and confessed she hated King's theme music, King had the chair shipped out to Winfrey in Chicago with a computer chip in its seat so that when Winfrey sat on it, the theme music played. Winfrey also helped King and her show in other ways. After a month on the air, Winfrey and Graham, a notoriously reclusive romantic pair, allowed themselves to be jointly interviewed by King on the air. Graham came to the Hartford studio, while Winfrey appeared via a satellite hookup. The satellite linking made television history as the first instance when two daytime talk shows had gone on the air together. The Gayle King Show enjoyed a year-long run, but suffered the fate of many personality-driven chat shows that glutted the airwaves in the mid-1990s, and its cancellation was announced in the spring of 1998. Though it was picked up for renewal by 85 percent of the affiliates, ratings had remained too low. King still appears on the 5:30 p.m. newscast on WFSB. Though Winfrey once offered her friend a seven- figure sum to come and work for her thriving production company in Chicago, King turned it down--again, because of her children. For fun, King regularly visits Winfrey in Chicago or at the star's digs in Florida, all expenses paid; as the best friend of the richest woman in the entertainment industry (with an estimated wealth of $550 million in 1997, according to the Forbes 400 list), King is no longer astonished that Winfrey can buy what she wants at the mall. "People always amaze me by asking, 'Aren't you jealous of Oprah?'" King told Ladies Home Journal writer Audrey Edwards. "I say, 'Why would I be?' I'm happy with my own life, and I'm so thrilled for her. When I visit Oprah I'm wined and dined and chauffeured around in a limo. And when I come home and can't remember where I parked the car at the airport or trip over the kids' toys, I think the visit was great, but I really like my life, too." Worked at WTOP-TV, Washington, DC, c. 1975; WJZ-TV, Baltimore, MD, production assistant, 1976; WDAF-TV, Kansas City, MO, 1978-81; WFSB- TV, Hartford, CT, news anchor, 1982--. Host of NBC daytime program, Cover to Cover, 1991; host of own syndicated half-hour show for Eyemark Entertainment, The Gayle King Show, 1997-98. 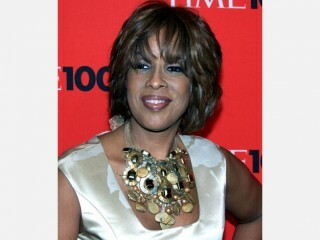 View the full website biography of Gayle King.